You have added Dazzling and Dotted Black and Gold Metallic Bodycon Dress into shopping cart. FINAL SALE. This sparkly black and gold party dress is chic, fun, and whimsical at the same time. This would be a cute New Years dress or just a fun party dress to wear any time. 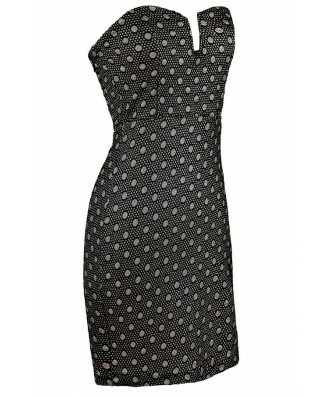 The Dazzling and Dotted Black and Gold Metallic Bodycon Dress is unlined. It is made of a slightly textured fabric with a bit of stretch. It has a pattern of gold metallic dots against a black background. It has a strapless neckline with a dip in the front. The empire waist gives way to the fitted bodycon skirt. A hidden back zipper completes this dress. The Dazzling and Dotted Black and Gold Metallic Bodycon Dress would look nice paired with black or gold pumps or strappy heels. Details: Made in USA. Lined at bust. Hidden back zipper. 100% polyester. Hand wash cold or dry clean. Small measurements: Length from top of bust to hemline: 28.5". Bust: 30". You have added Dazzling and Dotted Black and Gold Metallic Bodycon Dress into Wishlist. 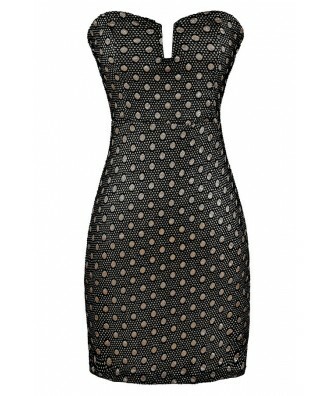 You have added Dazzling and Dotted Black and Gold Metallic Bodycon Dress for Stock Notification. 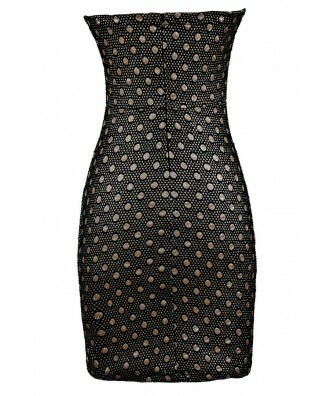 You have set Dazzling and Dotted Black and Gold Metallic Bodycon Dress as a loved product. 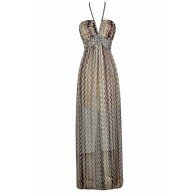 You have removed Dazzling and Dotted Black and Gold Metallic Bodycon Dress as a loved product.